The EGO Conference Committee, co-chaired by Joy Hayward-Jansen and Nirmala Vasigaren, is pleased to announce the Call for Papers for the 2015 EGO Graduate Conference, to be held on the UMass-Amherst campus, April 4, 2015. We make assumptions based on bodies all the time: what bodies are normative, strange, dangerous, fragile, familiar, foreign, and so on. The bodies we see are always-already constructed and commodified within various cultural marketplaces. 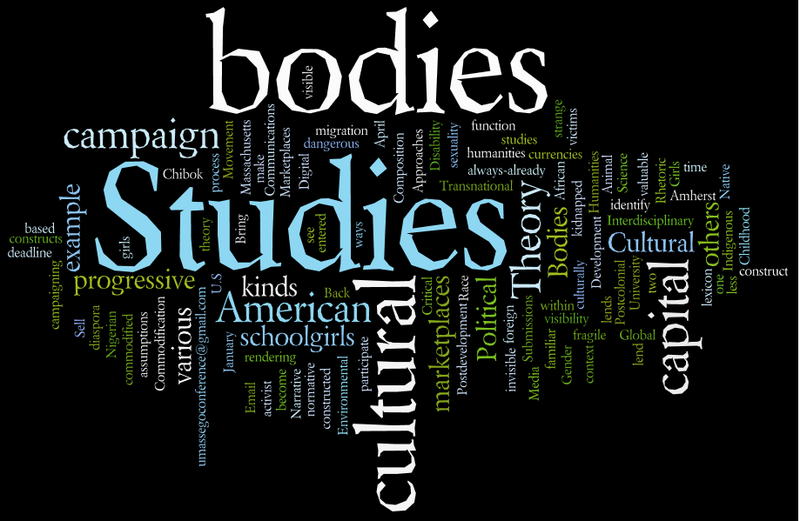 Bodies function as currencies, some of which have more cultural capital than others. This cultural capital lends visibility to some bodies, while rendering others invisible. For example, as the Bring Back Our Girls campaign entered the U.S. activist lexicon, the cultural capital of the kidnapped Chibok schoolgirls become visible only as ‘victims’. In the context of this campaign, the girls’ bodies lend cultural capital to bodies who participate in the campaigning process and identify as progressive. As such, the campaign constructs two kinds of bodies : progressive American bodies and the less culturally valuable Nigerian schoolgirls’ bodies. This is but one example of the ways in which cultural marketplaces construct various kinds of bodies. For our 7th annual interdisciplinary conference, the English Graduate Organization at the University of Massachusetts-Amherst invites submissions that examine the ways in which cultural marketplaces construct, produce, erase, value/devalue bodies. Submission deadline is January 20, 2015. This entry was posted in Conference and tagged Call for Papers, CFP, Graduate Conference, The EGO Conference Committee. Bookmark the permalink.